We've not been big on cinema release announcements (shame on us), but when a press release for a Chinese martial arts film that was produced by John Woo, stars the fabulous Michelle Yeo and that was described by The Global Times as "The best wuxia film since Crouching Tiger, Hidden Dragon," we're at the very least intrigued. In Ancient China, "Drizzle" is the most deadly and ruthless assassin of the Dark Stone gang. After a life of theft and murder, she seeks to atone for her ways and leave the gang forever. Undergoing a drastic procedure to alter her appearance, she changes her name to Jing and starts a new life in the capital. Even with her newfound life as a shopkeeper and a budding romance to Ah-Sheng, the Dark Stone gang is hot on her trail. She alone holds the secret of the mystical Buddhist monk’s remains, which legend says the possessor will gain control of the whole world. The gang will stop at nothing in their pursuit to control this power. 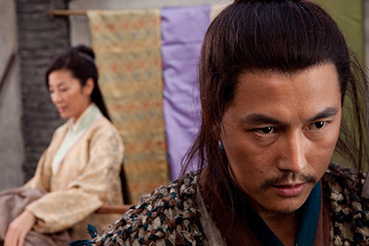 Nominated for ten Hong Kong Film Awards (including Best Picture, Best Director, Best Action Choreography, Best Cinematography), Reign of the Assassins (Jianyu) has been called a "lush visual treat" by the Hollywood Reporter, "A delightful martial-arts romp that makes up in wit and exuberance what it occasionally lacks in clarity and finesse" by Veriety, and "absorbing and entertaining" by Screen International, while Film Business Asia claims that "the film gives new life to a genre that's been pulled every which way in the past 20 years in search of new thrills." Cool. 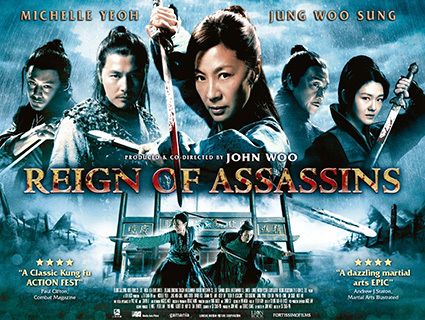 Produced and apparently co-directed by John Woo (the iconic director of such action classics as A Better Tomorrow, The Killer, Bullet in the Head and Hard Boiled) and officially directed by Chao-Bin Su	(the man behind the intriguing Taiwanese horror Silk), Reign of the Assassins stars Michelle Yeoh (Wing Chun, Crouching Tiger, Hidden Dragon), Woo-sung Jung (The Warrior), Xueqi Wang (Warriors of Heaven and Earth), Shawn Yue (Infernal Affairs, Initial D) and Barbie Hsu (Silk). The film hits UK cinemas on 15th February 2013 and is distributed by Ratpack Films.